I began to work on the diminutive animation of the body, clothes, armor, and weapons of the character. The first show looks promising. I need to change the X position always by 2 down. Don't you have also to reduce the weapon armor animations? Yes, I plan to reduce everything - clothes, weapons, armor, and also gump pictures. But first I create animations, then I have to make gump points and then put others in it. 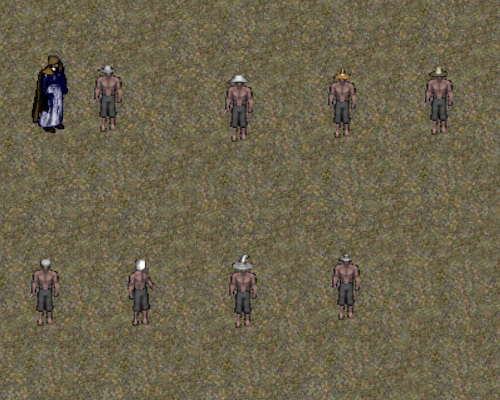 Well, Darksun, but I will not create all the animations. I will not do most Samurai Empair (not nice and good) and I do not know Mondain elf. There I will think a lot and choose. UO elf contains. Hobbits will be what I make. But, I will replace the Elven animation and gump with the small elf and Elf create the race using c_man. wow - that would be very usefull! Animation of children is not part of the original UO. Download it here and add it yourself as needed: Children.